In The Little Prince, the fox and the prince have a conversation about what makes that one particular boy, or that one particular fox, or that one particular flower special. In your own words, what does that quote mean to you? Apply it to your own life or other pieces of literature if you need to give examples in your explanation. The quote basically means if you love something or someone the are beautiful to you and if someone else doesn’t see don’t think they aren’t beautiful anymore that person just doesn’t see the real them. I agree. It’s like your mom, no one can see how special she really is because other people might not know her that well to say that she is special. It means to think about the person with your heart. even though there could be millions of copies of it the one thing you know. think about how your one person you love isn’t like the others. Its different since their someone you’ve been with for years yet their more important then others because you know the person and you just look at the others with eyes but you look at someone you know or been with for years with your heart. I believe what the Fox was trying to tell the Little Prince was the things that make your stuff more precious than the other millions can only be seen by you. For example the thing that makes the Little Prince’s rose so much more precious than the other hundreds of thousands is that he took care of it. He put his heart into keeping that flower alive and healthy. Technically they can’t be seen with your literal eyes. They can only be felt with emotions. That’s atleast what I believe the fox was trying to him. I do agree with you why the fox would tell him that and how special his flower is to him then the other flowers in the world because the little prince see the thing that is special with his flower by using his heart and others just see with their eyes and don’t see what the little prince see with his heart. To me, this quote means that you can only see, with your heart if someone is special, if you know them in the heart. For example, you may disagree with someone if hey say someone you don’t know is special. But, if you really knew them well in the heart, then, they would be spacial to you in their own way. This quote kinda goes along with when your mom, or someone you knows says your special. You are special to them because you know them in the heart. But, if you were to walk up to a complete stranger, they would not think your spacial, and you would not think they are special. But, I bet someone who knew that stranger really well would disagree, saying they are special. People have different opinions, but you have your own opinion if someone is special, but you olny have that opinion with your heart. I believe that the quote means everyone sees things differently. You may see one thing for what it is in your mind but totally different in another person’s mind. For example, if you looked at my friend Carli you would probably think she is an average, dark skinned girl. When I see her I think of her being my best friend and how she is just as weird as I am. Everyone sees things differently. That is what I think the quote says. “One sees clearly only with the heart. Anything essential is invisible to the eyes.” This is a saying from The Little Prince, that has a very special meaning. To me, the meaning is that you can only see the important and special things about a person with your heart. When anyone else looks at them with their eyes, they don’t see the same thing you do. You see something special, they see something ordinary. If someone looks at a person and don’t see the special qualities with their eyes, if they get to know that person, they will see the special qualities with their heart. Great comment. I is a great comment because its like you are finding out the person’s qualities. “One sees clearly only with the heart. Anything essential is invisible to the eyes.” To me this quote means, that everyone sees things differently. Mostly how kids and adluts see things. Kids will see things in a more creative way. Cause of they have more imagenation then the adults. And the adults will see things in a boring way. They don’t have a lot of imagenation, so thats why they can’t see things like the kids do. But it’s basically about everyone will see things differently then others. The quote “one sees clearly only with the heart. Anything else essential is invisible to the eyes,” i think means that you only see the things that have meaning to you. The picture at the beginning of the book comes into play here. The adults didn’t see the snake because it did not have real meaning to them. The adults just thought the drawing was the fist in their mind, a hat. But the kid used his imagination to see the other possibilities, the snake. this quote means to me that you must believe in the impossible and you will see and accomplish the impossible. there for you can only believe with your heart not your mind and anything that is boring and not a necessity isn’t visible to the human eye. Thanks I am glad I made sense. The essential things he is talking about is his imagination. The Little Prince thinks that grownups are to serious and boring though the fox knows that when the grownups got older their imagination was hidden inside them. For example when the little prince finds the well there is no real well he has begun to imagine it. Or the heat has gotten to his head and has started to hallucinate the well. After we have started reading I think that he is using his imaginaion. I think that it means that it doesn’t matter what it look likes. It matters how you got it or made it. You could have the worst toy in the world, but in your mind it could be better than every toy in the world. Like the Little Prince’s flower, it might just be an ordinary rose but to him it is the only one of her kind. It is Special to him in a way that no one else can understand. Several different ways it could be special is that you made it, or someone important to you bought it for you, or its just that special to you. I think that what the fox is trying to say is that, seeing is believing, but seeing doesn’t make your choices. It all depends on your heart. Seeing is believing, seeing with your heart. It is the only one that “sees clearly” and is the only one that can make decisions. Eyes only “sees blurry” your eyes are nothing, compared to your heart. That is an amazing way to look at the quote. This means that anything important to you can be invisible to someone else. It can also mean that importance, love, and special-ness aren’t things you can see. You can’t touch them. You can’t hear them. You can’t hear or taste them, either. They are only things you can feel. Not with you hands, but with your heart. My best friend is Jes. Others may see her as just an ordinary girl, but I see her as someone very important. This is may be something only I can see. Another reason may be this : If you want the truth, listen to your heart. “One sees clearly only with the heart. Anything essential is invisible to the eye” What does this mean? I think it means that on one certain thing people see it differently. It pretty much has to do with growing up.As you grow older you will see things differently. Just like in the beginning of the book when the author was a kid his drawing of a snake eating an elephant looked like a hat to the adults. The 1st part of the quote says,”One sees clearly with the heart.” Which means you see at something you’ll find it special. The 2nd part says,”Anything essential is invisible to the eye.” Which is saying that how they will see it they won’t see it. That’s what I think what the quote means. Also if it is something you care about than you can see it. “One sees clearly only with their heart. Anything essential is invisible to the eyes.” To me this quote means that people see things differently. By people I mean the way children use their imagination to see things different from adults. On the other hand adults make things seem boring. For example the Little Prince pictured a boa constrictor eating an elephant, but adults will say it’s only a hat. This quote also means that you might think someone is special for a reason, but other people think differently. Like the Little Prince loves his flower more than any other flower in the world. It’s kinda like you know your friends mom is nice, but you love you mom way more because she’s your mom. This quote basically means the way everyone sees things differently. The quote also means that you should look at things with your heart and not just with your eyes. Which means that look at things in a different way then you would normally. This is what the quote means to me and I believe this quote is true and everybody should follow this quote and look at things with your heart and not your eyes. I think i have a good idea of what the quote means.” When the author drew the boa constrictor, the adults were blinded by their own thoughts when they looked at it. They saw nothing important or essential because they didn’t look at it with their hearts, just with their eyes. When the author looked at it he saw something more, he saw beauty. He glanced at his picture with his heart and imagination. Although the little prince knew he wasn’t a good drawer, he believed that the he was an artist and that was good enough. I think that this quote means to see things with your heart and not just with your eyes. I also think that anything essential is invisible to the eyes because it’s important and you use your mind more than your heart when things are important. So it becomes invisible to the eyes because your not using your heart. When you see things clearly, its because your listening to your heart. And your heart is who you are inside and if when you listen to it, good things happen. and your dreams could come true. I think it’s somewhere around those lines. I’m not sure because i don’t think i am explaining it right. So i don’t really know. I just confused myself. The quote means that things that you love are more important to you because you care about them and you spend time with them. love is the only way you know something. for example i would do more for my sisters than someone else’s. Anything you want with your eyes is not important. For example people want things like money but many times money ruins family. “One sees clearly only with the heart. Any thing else essential is invisible to the eyes.” This quote can have a lot of different meanings. To me, it means if you really love someone you can only feel it in your heart. You can’t just look at someone, and think you truly love them. If you were to look at someone, only you could see the special things about them. If someone else were to look at them, they wouldn’t see what you do. All of the extraordinary qualities you see in a person, can only be seen by you. I think this quote definitely is important when reading the book. To me, this quote means that sometimes the things that you need will be invisible to see, and it’s hard to figure out if you need it. The part: ” One sees clearly only with the heart.” This means you can see and know the things that you miss because they hold a place in your heart. An example for the Little Prince might be the flower. This means that you can only find love at happiness through your heart. If you look with your eyes you will never ever be happy. You need to feel in your heart for the right person. Only then will you find happiness and beauty. I agree that you can only find happiness threw the heart and that you need to feel it for the right person. Great job Matt! I completely agree with you because i also think the book is trying to say you can only see what you love or think is full of beauty. I think this passage means that you can only believe what someone says with your heart without seeing it yourself. If you look with your eyes at the person telling you, you wont see the truth in the person. This quote means many things to me, but it seems to have one big reason. It means that if you truly love something, you are seeing with your heart. If you see something with hatred, the you are only seeing with your eyes and not you heart. Take a pizza for an example. someone can love a pizza with their heart, and love the sauce on it. someone else could also take a pizza and love the cheese on it. But overall, both people see the pizza with their heart. If someone sees a pizza with just their eyes, then all they will see is a plain old pizza. If you follow your heart and only see with that, you will see things in more perspectives( this is how a kid sees things). When you grow older, you start to see with just your eyes, and don’t enjoy life as much as a kid would when they see with their heart. This also means to care about other people with you heart then with just your eyes! I get what your saying. This is a good way to put the saying in a perspective that everyone will get. I see pizza with my heart. First i agree with you. I love the comparison you made with pizza. It fits right in on what you were saying. Skyler! What made you think of that?!?! That is an amazing example that was funny about the pizza thing too. How did you think of that?!?! that means that like when you tame an animal and then you put 7 other animals just like that one you can tell which one is yours because one sees clearly only with the heart anything important is invisible to the eyes. I think it means that only you see the connection with someone. If there were a million you can find the right one. No one else might see it in them but only you know the real them. What the fox means is the you have to look inside you heart so you can see clearly. The things most important are hidden behind the human eye. Sorry I mean THAT you have to. I like how you put your thought into that and I agree with you. That is a really good idea. Also I think that is true. Wow that’s a really good idea! I’ve never thought of it like that! I absolutely agree with what you are saying here. It means that something that is inportant to you, you can only see it as inportant. When you care for something, your heart does. And only you have that heart. I think the fox is trying to say is what you have is special even though there is millions of them, and you should care for them. If you really love something you can see it with your heart, but if you really hate something you will see it with your eyes. I like your answer. It makes sense. Like if you put six untamed dogs by your tamed dog, you will know which one is yours by how it acts. You can also tell which one is yours by how it looks and how it wants to come by you. To me what the fox was saying could be answered in a million different ways. And maybe none of them right. But to me i think that this quote that the fox told the Little Prince means that when you look at something or someone and think about them with your heart they are so much more important to you. Maybe you have had a close bond with them for a long time. For example, how the fox said whenever he looks at the wheat field it will remind him of the Little prince because of his hair color. And he will always think of it fondly, remembering the close bond they shared. To me that is what the quote means. Whenever you look at something/someone and you think about them with your heart and how special they are to you. But the other part ” Anything essential is invisible to the eyes ” to me means that just looking at someone will tell you nothing. Like if you think of someone with your heart you will definitely think of them admiringly. But not if you just look at someone with your eyes, then you will just recognize the person or not recognize that person. And like how the boa constrictor was right next to the quote i think that it could mean that kids might look at it with their heart and figure out something with their imagination. But if an adult looked at it then they might only look with their eyes, and see a hat. to me the quote means that what you care about is more important than anything else. i kind of agree with grant when he said money can ruin a family. its true if you care about some game or something that you want more than the people you love that bond that you have with that person or group will be broken. and that will make people think that you don’t care. I think the quote means that something or someone is only special to you and nobody else can see that but you. Other people think that that something or someone is really the same then any other but you see that as a whole different thing, that only you can see the difference in that something or someone. That’s a great idea, that’s what I was trying to say. As you can see I totally agree with you that something or someone that is special to you but may not be to you friend. I do agree about how no one can see how the person is special but you. That’s a great way of thinking about it because it goes along with the story and how the flower on his planet and all of the other people on the other planets stand for things or people in the author’s life. I do agree with you and how someone mom is special to that person and others see just a mom and not how special they are to that person.And I thought was a great Idea that you put. I think that is a good idea but i don’t think that is what the author is trying to say. i think that he is trying to tell us that your heart will let you know when it needs someone not your eyes. your eyes will deceive you. Your eyes can trick you, I agree. But some are blind to things around them. The things that you need you will not get by looking with your eyes, you need to feel in your heart that that is what your looking for. this quote makes me think of a relationship. You can’t just go out into the streets and look for a boyfriend/girlfriend you have to feel in your heart that he/she is the one that you are looking for. Your eyes can play tricks on you but your heart would never trick you. The quote means that everyone sees things differently. For example you might see your family as special and your friend might see their family as special. My brother may think differently than me about our cousin, he might like her more than I do because he spends more time with her than I do. I agree with you that everyone see with eyes but one person see with their heart and how special his family member is to that person. “One sees clearly only with the heart. Anything essential is invisible to the eyes”. This sentence means what things mean to you. If you love something then you put that exact same thing next to each other you will know which one is yours. Say if you put an exact replica of your favorite thing like your pet you will know which one is yours because it is close to your heart. Like how the little prince feels sad that there is a lot of roses just like his but they aren’t exactly his because his flower he has is his and he loves it so you can’t replace it even if you had one that looked exactly alike it would never be exactly alike in any way. The author is trying to say that if someone has something just like your and that person thinks his is better it will never be yours will always to you no matter what. That thing will always be better to you maybe not to someone else but that doesn’t matter it only matters to you. also if you look at someone only with the eyes, you can’t tell who that person truly is. If you look with the heart you can tell who that person really is. I think that you gave good reasons to your answer. It made a lot of sense how only one person can tell the difference between a million different connections. I think that this famous quote means that everyone that you love can be spotted even if there are people just like them. I also think that this quote was put in the book to show how the author feels.Maybe the author put this quote in the book because maybe he loved someone and thought he knew them so well. But when he finds out who she/he really is then it turns out that he really didn’t know him/her at all. Also that the picture of the drawing of the Boa Constrictor that swallowed the elephant had something to do with with this quote. This picture was spotted in the beginning of the book. This pictured showed that kids had more imagination than adults. But that was only showed in the beginning of the book. When it gets to where the quote is shown I thought that the elephant was part of the quote. That there was an actual reason behind the drawing of The Boa Constrictor that ate and swallowed the Elephant. So finally I think that the author put the quote in the book to show how he felt. To show that if you think you know everything about someone you might not know anything at all about them. I completely agree. I mean, lets say there are a million clones of your pet or something, you would be able to find it from close bonds. Like, the fix said “tame”. I believe the quote means anyone you now really well or someone you love or that there beautiful and mean a lot to you, if someone doesn’t think the same thing you think it doesn’t mean you have to stop loving them or stop thinking there beautiful. They just don’t see the real person. Great comment. I believe that is what the quote really means because that is like your finding out what that person really is on the inside. Thaisha, I know where you’re coming from, I actually like, half agree. Because there is more to it than that. Like, the adults only see appearances. The kids see with their hearts. Kids only see what’s on the inside, so that was a great way to put it. ” One sees clearly only with the heart. Anything essential is invisible to the eye. To me, this quote means that if you look at things with the heart and imagination, you will see the true meaning. If you just look at it with your eyes you won’t e able to see the true meaning of things. An example of this is the snake. The adults thought it was just a hat, but they only looked at it with their eyes, not like how the kid thought of it. He looked at it with his heart and imagination and found the true meaning of the drawing. I think that is true about the snake how the adult think that its a hat but they didn’t have any imagination cause it was really a snake. so i think that would be true. I think that the quote means you have to look at people on what you know about them. If there is a million of them what makes it special. In order to be special you need to know about them and you choose from your heart. You shouldn’t choose on what they look like. You might not even know what kind of person the are. Your heart has to choose who is right and who is not. You might think someone is a bad person on how they look, but really they could be a good person after you talk with them. The little prince had one rose and found thousands of them in a garden on Earth. He only thought that his rose was special because he knew all about it. He wonders what makes his so special when there is a lot them on Earth. To me the little prince knows is special because he has been with it and knows its a good rose. Its like you think a new person is a bad person because of how he dresses but really when you talk to him they are nice. To me the quote is saying that you should not judge people until you know them with your heart. I thought back to the beginning of the book when The Little Prince showed the drawing of an elephant in the boa constrictor. The adults thought it was just a hat, but the quote goes along with the drawing. The quote is kinda saying, “People with imaginations see what the drawing is,’one sees clearly only with the heart’, adults don’t see what is needed in the drawing,’anything essential is invisible to the eyes’. In other words, the artist sees what he wants to see, not what everybody else is seeing what the real picture is. i agree! that makes so much sence. and i like the way you used the boa constricictor!!! I totally agree with you Joselin, i think the author put that in there to teach a lesson and show exactly what you said. Well, I hear you, but the fox actually said that, not the snake. And I thought about it like adults are blind and kids have the world at their fingertips, and they understand a lot. This quote to me means that some you can only love someone with your heart and not your mind or eyes. Well, I think that the quote means like say as if all of the kid’s moms were lined up in the classroom and you had to pick which one you thought was the best. Well you would think that your own mom was the best because she is your mom. This means that the person who you thought who would be the best would be like a very close friend or one of your family members or any neighbor. I think it is telling how people can only see what they love.If you dont love something then essentually you cannot see it.Kind of like the vain man and how he only he only heard comments about himself.So you will only see what is closest to you in your heart. I agree you only show your love.The eyes can’t see a thing.Only what you think is that nobody else will see the same thing. L agree u always have to keep something special. Some that special can last a life time. don’t listen to people their Julius. Like you said always keep something special close your heart. don`t forget about it. Lindsay i totally agree with you. Because i think that since you can’t see clearly with your eyes then you can’t judge a person on how they act. Also i really like your idea on how you think that after you see someone clearly then they can be close to you and to your heart. I agree of what you said.Your shows how you feel about thing that nobody would. Like the Little Prince of his flower and the planet.Nobody will show the same thing to the planet and his flower. In the book The Little Prince, the Fox and the Little Prince have a conversation before the Little Prince leaves. The Fox says, Only one can see clearly with the heart. Anything essential in invisible to the eye. I think it means that if you truly love something that it would be your top priority. Or that there is something you truly love, you will never think any thing is better, and you will never give it up for anything. I think it’s about how kids can see with the heart and adults can, just appearances. I meant adults can’t, it’s like they are blind to what really matters. I agree with you because the way you explained the saying great job. well i think the quote means if you think that something or someone is beautiful fallow your heart even if someone else says that something or someone isn’t beautiful , maybe they just cant see that somethings true potential yet . I think that it means that you don’t use your eyes to see you see with your heart.It’s pretty much like “don’t judge a book by it’s cover” or like if someone looks trustworthy they might not be trustworthy.so just trust in your heart.or it could be like blind people feel not see.but just pretend your blind just trust your heart. Ricky, that is a great comment and here is why. You gave great examples, you described what it meant to be a person who really cares about one another good job! Quote: Here is my secret. It’s quite simple: One sees clearly only with the heart. Anything else essential is invisible to the eyes. Answer: It means you have to listen with your heart, give things a chance. If you open your heart and think about things with it, everything will seem clear. That also goes with what adults do. Kids can understand everything, but adults think it’s nonsense. Kids understand more than you give credit for. If you walk up to a 10 year old and ask them what they thought about some political thing, they will say spot on, there should be peace and money is not an issue. People should love each other and be happy to live on earth with the things they take for granted, and abuse. Like power. Adults would say some mashed up stuff and tell you what it’s really not. they would say it’s complicated and it’s all about money. Kids don’t care about money. But how this relates to this, is that kids look with their heart. To kids, even the ugly things are beautiful. To adults, they are blind, they understand what all the mashed up words when it’s way more than that. Kids understand everything, and adults can’t, they are blind to everything, letting the confused world go by. That’s where their imagination goes, it goes into political nonsense about money and other stuff. i think that you are right life is to short to go through it being unhappy and i think that your right if you open your heart and give things a chance and things wont be so glum all the time . you have to listen to your heart and give life a chance and if you cant even do that then what is the real point of living. l believe the fox is try to tell the little prince is that you have one love. The rest is just nothing. The little prince loves his rose not the fox. The fox is just a friend. That why they said good bye. So the little prince can go back to his plant and be with his rose. “one see’s clearly only with the heart. Anything essential is invisible to the eye. I think this could mean alot of things but for starters i think i means that if you are looking with love u can see any clearly, but if you are looking only with hatred every thing is unclear. I think this was said because, the little prince left his planet in the first place to get some where eles because, he thought there was more out there more for him to experence so he left his flower cause he thought there was something better but now that he is gone i think he finally realizes that what he had back on his planet was all he really wanted and needed.At least that is how i see it!! To me this quote mean that you may have something or someone that is very special to you and no one else sees how special you think it is. For example if you were to have your classroom to bring your pet to school. You know how important your pet is to you but the person next to you thinks that there is more special. So if you see with your Heart you love your pet the most because you love your pet. but if you look at your neighbors pet you will think nothing of there pet because anything else is essential is invisible to the eyes. i think that the quote mean that if you belive something you would always see it and you would always think its true. but if you dont belive you will never even see it. that means you will never really be a good person. if you sometimes belive something then it would be like seeing though your eyes. when looking through your eyes you dont always see things so clear. but if you never let go and always belive more and more thinngs and always set your mind to think its true. then when you are like this, then you are seeing things with your heart. its always better when you see things from the heart. this is because most people would like to see things clear. there are not as many people that look through the eyes instead of the heart. That quote ment many things to me. For example, having a pet. You can only see it as the best pet in the world. You don’t know about anyone elses pet, just yours. Another example would be for your grandparents or other relatives. Some people might just think that he or she is just some person walking down the street. No, you see your mom or dad walking down the street. You think they are special compared to that person’s mom or dad. They all just look like people except for a hand full of relatives a parents. It is not that they mean nothing to you, it is just you don’t know them the way you do. All the people you know are special. If you don’t know them, it seems like they are just some people. They have families to. The fox didn’t have a family though. So he thought everybody was just a nothing until he met the Little Prince that tamed him. Now the fox only thinks of him as a friend and a friend only. Plus it made the Little Prince fell better too. So it turned out to be a happy ending for everybody in the end. I think that the quote means you can only see someone truly with your and not with your eyes. For example when choosing a book you musnt use your eyes because you cant judge a book by its cover. Just like if you would want to make new friends with someone you wouldnt look at them and say oh I dont like the way that person looks so im not going to be friends with them. You have to look in your heart. The same with anytihng else like maybe garbage bages or something you have to use different kinds to see which one works the best and which won dosent work. This is what I think the quote means. Honestly i think the quote means that the many things important in life are blind to the eyes but not to the heart. And that many people don’t realize it. Like the one that you love or will love you may not see it with you eyes. But if that person is the one then you heart will know. Also I think that the quote means to not look at things and judge them right away. Because your eyes are blind to what they are really like. And until you open up to that person and try to be friends with them. Then you won’t know what they are like. And as soon as you are friends with them then you may decide if they are a good friend because you heart will be open to them. And you will see them clearly because your heart will tell they are good or nice or whatever. Also i think that it means that if you look with your heart you will be blind to all of the important things in life. And if you don’t try to look with your heart those things will pass you by. And you will miss out on it. And you will be the left behind because you didn’t try new things and you didn’t try to open up to new suggestions. I think that the quote “One sees clearly only with the heart. Anything else essential is invisible to the eyes”means that children see every thing in their heart and see it to when it comes to mostly everything.But grown-ups on the other hand are blind the don’t see anything though the heart.All they see is the essentials though the eyes.That’s all because of how the children think and how the grown-ups think.The difference is that the children think like how children are supposed to think,but the grown-ups think that they are just being silly.The grown-ups think that because they are all grown up and don’t get how the children think,all they do is think that a boa constricted with an elephant inside is a hat . So that is what the quote “One sees clearly only with the heart. Anything else essential is invisible to the eyes” means to me. I think that the fox was trying to say that the Little Prince and him were meant for each other. 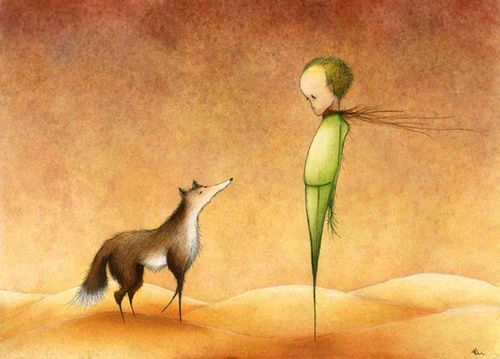 If the Little Prince wasn’t meant for the fox no one else would be because the fox doesn’t ever really see humans. Maybe the authors talking about somebody he loved and he was sharing his feelings through the line “One sees clearly only with the heart. Anything essential is invisible to the eye.” The fox was trying to tell The Little Prince that if the two of them were meant for each other the fox would be happy knowing he would come back but as the went longer the fox would start to miss him and wish he would be home. He might also be saying that you cant tell if you love somebody by their appearance your heart has to choose who you love. You have to know how that person is special and what makes them perfect for you. When the Little Prince saw all the roses in the rose garden he didn’t think his was so special anymore because thousands of them were on planet Earth. The same thing was with the volcano was nothing compared to the giant mountains on planet Earth. I think the quote means that you can see in your heart that someone is special to you and you can’t see how special that person with your eyes because you never got to know how special they can be to you.Even if you meet a lost family member you find that are not that special because you never got to know them how they are and how they mean to you,like the little prince when he met all the roses he felted liked his flower was not that special has he thought it would be.But when the fox tells him a secret how you see with your heart is special that flower is to the little prince. The quote , ” One sees clearly only with the heart. Anything else essential is invisible to the eyes.” means that you can love something that has multiple things exactly alike, and think it is the only one of it’s kind. The first part of the quote, ” One sees clearly only with the heart. ” means there can be millions more of the same rose but since you love that one rose, you think it is by far better then the others. The second part , ” Anything else essential is invisible to the eyes.” means to me that the other million roses in the world are just ordinary roses. But yours is special and is one of a kind , and you can’t stand to think that there are more roses in the world and your rose is just an ordinary rose, just like the other ones in the universe. The roses are just used as an example , this quote can be used for anything. Such as , your mom. You think your mom is the best mom in the world, but there are many children that think the same things about their mom. I think the saying means that if you turely love something so much you just might be or feel like all you can see or all you can think about for a day or for the rest of your life.For an example when Little Prince found the Rose he thought it was the most fantastic,wonderful because he loved the flower because the flower is his he proteces it he cared for it and he left it all alone and he was upset and terrible missed his FLOWER because he was like a DAD to the flower,even though the flower was rude,mean to Little Prince and Little Prince.And that is what I think the saying means. The meaning means is you see somebody with your heart.The eyes just means that can’t tell how that person is only the heart can.Like saying your mom,nobody can tel which mom is the best.The heart shows how you love that person.When your eyes see,it only means that you can’t tell if they are good or bad.If something means a lot to you,other people just think of it’s nothing compared to the way of how you feel.This saying can also mean is how you show your love to a lot of thing that are very important.Nobody will show the same thing that you show.Things that you that nobody else would see or show that way. Explaining the Little Prince, of his flower and his planet. The quote to me means that you can only see who people really are if you know them. If you don’t know the they would just see them as some regular person. Like it said in the book its a matter of being tamed. If you are tamed by a person then you are seeing them with your heart. If you are seeing the person with your eyes then you don’t really know them. Mr.Curtis told us that if our moms came in every one but us would just see the as regular mom, and no body would see how special they are to you except for you. That is what the quote is really about. The quote means that things that you love the most can only be seen by your heart.For example, if you had a book or stuffed animal people would just make fun of you but really only you can see why you love that thing so much.Like me, i have a picture of me and my whole family and some people make fun of how they all look but to me i love it and i can only see that. No one else.Just me. Things that you just see like an animal or a flower it means nothing to you because you cant see it with your heart.If i see an other picture i just see that picture, nothing else.But if the owner of that picture sees it, it might mean something meaningful. Many people see things of other people and laugh or think nothing but to that person, it does mean something.